Given a choice, estate regeneration schemes would not have been my natural topic of conversation. Now, I’m so versed in the subject that I could probably achieve academic status. ‘Gentrification.’ ‘Affordable’ housing. Social housing. Displacement. Labour-run boroughs. Investors. MIPIM. Developers and demolition. Those words are used with very great frequency and in a wide range of conversations these days. My own journey into housing campaigning was triggered between 2010 and 2011 when Waltham Forest Council carried out a review of all its estates to “identify which required investment and intervention beyond planned maintenance and to improve the quality of the stock, deal with issues of underlying tenant dissatisfaction and to reflect council priorities to regenerate local areas and communities.” To that end, their review identified “Marlowe Road as a council estate with the highest priority in the borough for intervention.” A flawed consultation/assessment survey was carried out over five months from September 2012 – January 2013. The aforementioned was nothing more than a box ticking exercise. It is doubtful that any of the views of respondents were taken into account. The end game was likely always going to be ‘demolish and rebuild’ and the all-too-familiar social cleansing that accompanies it. Out of sheer frustration and in order to debunk the council’s stream of untruths about the development, I pitched a column called ‘Life on the Estate’ to the Waltham Forest Echo. Since December 2016, I have written with forensic detail about the harshness of living through a regeneration project. The links are found below. 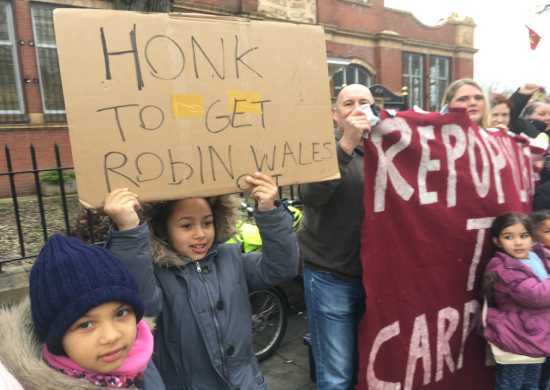 Wave goodbye to Robin Wales – unpopular Mayor is deselected by Newham Labour! Finally! Robin Wales has been deselected as mayoral candidate for Newham Labour after a tense battle against Rokshana Fiaz, who will now go on to face the electorate in the local elections in May and won by over 350 votes. The news of his deselection was announced on Friday 16 March 2018. It was Robin Wales, who told the original group of 29 mothers from Focus E15 hostel (after cutting the funding to the mother and baby unit) that “if you can’t afford to live in Newham, then you can’t afford to live in Newham”. Robin Wales has been in charge of Newham council for 23 years as he was head of the Council from 1995 and Labour Mayor since 2002. He has been an unpopular and unreachable figure. He spent decades promoting policies that has led to social cleansing, forcing working class people out of the borough whilst leaving homes empty and boarding up Carpenters Estate. Today 1 in 25 people in Newham are homeless as a result. Focus E15 Campaign will be pleased to see the back of Robin Wales – because he was an advocate of kicking out the poor and most vulnerable, running a council with £563m debt after reckless borrowing from the banks and lately using the equivalent of a staggering 125% of council tax revenue on debt repayment. However the campaign also knows full well that the pressure needs to be applied to the new (very likely Labour) Mayor to promote a sustainable housing policy that benefits and suits the needs of working class residents. “Robin Wales is out! We have spent, four and a half years fighting his social cleansing and demanding the repopulation of Carpenters estate! So many times being locked out of council meetings, attacked by private security at the Mayor’s show, arrested illegally for protesting against wrongful evictions and now he is out! Good riddance. However the fight is not over. We must make sure that the Newham People’s Charter demands are heard and met. And Robin Wales I think you will need to use Workplace and find a new job… can’t imagine anyone wanting to employ you though…. Please do join us in our celebrations to mark an end of a long era for Newham at our weekly stall on Saturday 17 March – 12-2pm outside Wilko’s on Stratford Broadway, London E15 1NG and then afterwards for more adventures on the free Focus E15 bus trip around Newham. Bring children, placards, food and drink! The following blog post is taken directly from a report written for the Revolutionary Communist Group’s website. Thank you for allowing Focus E15 Campaign to reprint this report in full below. Robin Wales, head of Newham Labour Council since 1995 and Labour Mayor of Newham since 2002 is facing the end of his reign. Rokhsana Fiaz is standing against him for the Labour mayoral candidacy and the results will be announced on Friday 16 March after local Labour members have voted. This situation came about after a trigger democracy process which has forced Wales to accept a challenger for the first time. All Newham wards voted for someone to stand against him. Wales is running scared and after decades of vicious treatment of working class people in the borough, he now proclaims himself a socialist leading a radical council. Nothing could be further from the truth. Focus E15 Campaign has been working with Sara, a mother of two young children in Newham. Her story is outlined on the Focus E15 website here. Since she refused to be moved to Birmingham, Newham Council says she has made herself ‘intentionally homeless’ and has discharged their duty to house her. On International Women’s Day, Thursday 8 March, Fight Racism! Fight Imperialism! 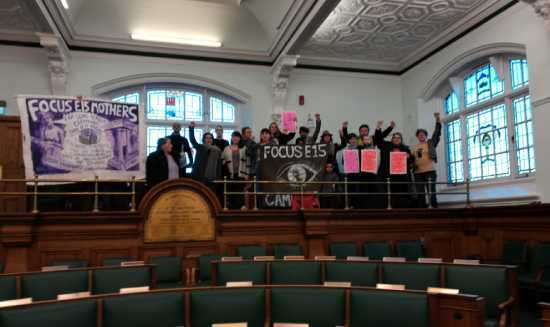 stood with Sara and Focus E15 Campaign, alongside children and parents from Sara’s son’s school, Museum of Homelessness, Streets Kitchen and Newham Green Party, as we challenged Robin Wales at the Mayoral Proceedings. This meeting is where Robin Wales rubber stamps anything he likes surrounded by his hand-picked cronies from the council. Usually an hour long, on 8 March Robin Wales looked shifty and nervous as the public gallery filled up and he raced through proceedings. After only 22 minutes he and his colleagues made a swift exit. They saw and they heard but not one stopped to look at the messages on the banners or placards nor listen to the speeches and chants from the gallery, as we demonstrated our solidarity with Sara. There is no such thing as intentional homelessness and Sara must be housed in Newham, near her family and support networks, in her community and where her children go to school. 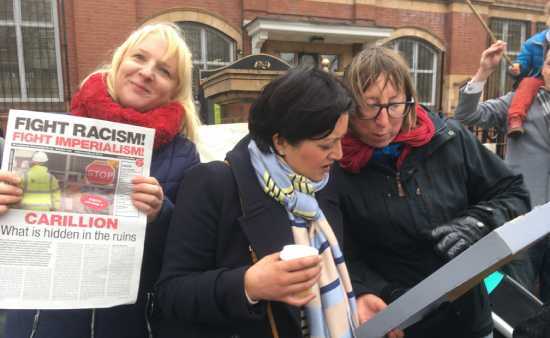 With news of the protest spreading on social media, the local press took interest and Wales’ challenger Rokhsana Fiaz asked to meet with Sara and Focus E15 Campaign. Newham Council was forced to issue a statement defending their callous treatment of Sara and her children and standing by their decision to refuse her any further housing support. The pressure is on, but we must all remember that Sara is just one of thousands of people and families who are facing social cleansing in Newham and at the hands of rotten Labour boroughs all around London. We must also be aware that replacing Robin Wales, while a huge victory after his years of abuse of working class people, migrants and the most vulnerable in our communities, will not solve the problems of capitalism. Rokhsana Fiaz says that housing is first of her top three priorities. It is up to us to hold her to account. Focus E15 Campaign has pledged to do this. Join us! People filled the hall in the Carpenters and Dockland Centre on the Carpenters Estate on Saturday 3 February at a public meeting, hosted by Focus E15 Campaign and with invited speakers from Fight Racism! Fight Imperialism!, the Housing and Mental Health Network and Kate Belgrave, journalist and housing blogger. The meeting was held in the grounds of the Carpenters Estate, where over four hundred homes lie empty in a Labour-run borough which has a rising homeless population and many people sleeping out on the streets. The meeting was proposed after hearing issues affecting parents in housing need, who are being labelled intentionally homeless and then finding out that the council no longer has a duty of care towards them, but has for their children – meaning that social services may be called to intervene – a frightening prospect for any family in housing need. The chair of the meeting set the scene well by describing the 100s of thousands of children in B&B and hostel accommodation in Britain, which is the six richest nation on the planet. Over two million people, including children are living in privately rented homes in England that are so squalid their health is affected and over half of all children in Britain’s poorest areas are now growing up in poverty. While almost eight months on from the Grenfell Tower fire, in the richest borough in London, 100 households (including hundreds of children) of the 208 made homeless are still in emergency accommodation/hotel rooms. The speakers from the Housing and Mental Health Network spoke very clearly about the link between housing instability and mental health problems and how people are being asked to parent in situations that are fundamentally not suitable. The end of short term rental tenancies are the biggest reason for people being evicted and forced into temporary accommodation. From the floor, we heard from and about Newham residents fighting intentional homelessness and fighting to stay in the borough and Libby Liburd, actor and writer, spoke about her play Muvvahood and her next play about temporary accommodation… keep up with her work at http://libbyliburd.co.uk/index.html. A Newham resident speaks out. I am a single mother of three who was in private accommodation for seven years and was evicted when the landlord wanted to sell. The landlord became aggressive, and has currently kept the deposit and tried to sue me for contacting environmental health about the mould. My daughter was born extremely premature and has chronic lung disease. I can’t afford another place in the private sector and the landlord still has my deposit. I suffer with Anxiety and OCD and both my children have medical problems. My children are not currently staying with me and are staying with their father and grandparents. I have chosen to do this because I don’t want them to be in the horrible temporary accommodation I have been given. I can’t cook adequately there. I am staying at the property in the evening and leave early in the morning to get the children ready for school and to take them to school. I stay with the children until they go to bed and then I go back to the property. The house the children is in is overcrowded. Newham Council is fully aware of my difficulties and have letters from my psychiatrist detailing how I am currently suffering a significant deterioration in my mental illness due to recent changes in my housing circumstances and made particularly difficult and unbearable due to my Obsessive Compulsive Disorder and Depressive illness. The housing officer said that Newham Council has carried out their duty by giving me a house and that no one can say how long the temporary accommodation will be for. I am very ashamed of being in this situation and more so having to put my children through it. We demand housing justice for Newham’s residents. Join us on our weekly street stalls, Saturdays 12-2pm on the Broadway in Stratford outside Wilko’s and come to the next campaign meeting, Saturday 3 March 2.30-4.30pm at Sylvia’s Corner, 97 Aldworth Road, E15 4DN. Robin Wales must go! The Carpenters must be saved! Caught on camera with Newham Nag! The Newham Nag is a spoof magazine, put together by Focus E15 campaign and Debt Resistance UK to bring some truth to the streets of Newham and to challenge the Labour Council’s in house magazine,The Newham Mag, which unfortunately pops through people’s doors every two weeks. The latter publication is full of pictures of smiling Mayor Robin Wales telling us all what an inspiring borough Newham is, when in reality, Newham faces huge debts from LOBO loans, instigates ongoing social cleansing and has residents living in towers with cladding that has failed recent safety tests. Newham also owns many empty council homes like those on the Carpenters Estate where 410 homes are still boarded up and remaining residents there now face eviction and are worried about where they will live. The borough has a rising number of homeless people sleeping rough or living in temporary accommodation. Plenty of reasons then to Nag Newham! At the annual Newham Mayor’s Show in July this year, Focus E15 campaign spoke to local residents and ran an open mic outside, demanding safe, secure, long term housing for all and distributed the Newham Nag for free. The campaign set up outside the show grounds because Newham council will not allow anyone to hand out their own literature inside. Our campaigners and supporters made sure everyone got a copy of the Nag as they came out. If you feel concerned about housing safety standards and the rising number of residents sleeping rough or living in inadequate accommodation then join us on the streets, 12-2pm every Saturday on The Broadway in Stratford for a public speak out and stall with open mic. Please also join the campaign on Monday 23 July at 1pm at Bridge House in Stratford to demand Newham Labour council saves the Carpenters Estate and that it is repopulated immediately.